Classified as members of the Tidal Class, Thunderdrums are large dragons that can thrive in land or sea. 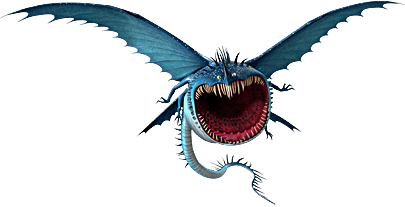 They are known for their massive mouths that generate sonic blasts strong enough to stun a human at close range. For this reason, Thunderdrums are believed to derive their power from Thor himself. Because of their sonic blasts, Thunderdrums tend to be nearly deaf, making them immune to the Death Song’s call. They can fly at extremely high altitudes. Along with their incredible strength, they also possess a prehensile tail that is strong enough to carry heavy items. They can breathe fire too, but this takes a lot of energy out of them and is not their preferred method of attack. What is also fascinating about the Thunderdrum is how it swims through the water. It has the ability to expel air from its lungs to flatten its body. This makes it easier for a Thunderdrum to skim along the surface of the water, or to dive deep down to hunt for food. These dragons may be strong-willed and intimidating, but with a dedicated trainer that is just as stubborn, the Thunderdrum can become a loyal friend at the School of Dragons.